A day packed with adventure, this package brings you the best family whitewater rafting in Colorado combined with a hot, hearty lunch and exhilarating zipline tour to start. Park your car in the morning and we’ll take care of the rest. Our Mountaintop Zipline tour takes place onsite at our Granite Outpost up high on our 44-acre mountain property. 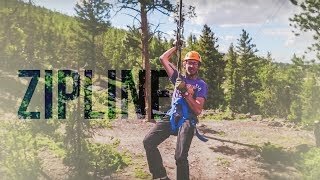 Begin your morning with a 6-line zipline tour, including our 900-foot line from cliff to treetop, dual racing lines and a 50′ free fall. Stop to refuel as we cook you a hot chicken fajita lunch. Continue on to your 3/4 day whitewater rafting trip. 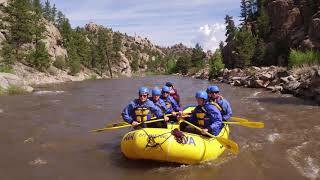 Browns Canyon on the Arkansas River is one of the most renowned section of rafting in the country. 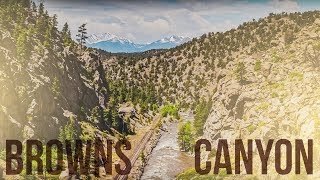 Traveling through the Browns Canyon National Monument, you’ll unplug and relax while you get your heart racing! 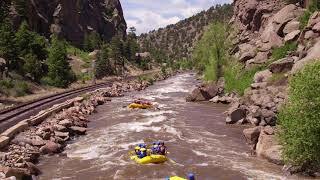 3/4 day rafting trip on the most famous section of the Arkansas River – our most popular trip! To get ready for the Browns Canyon Express + Zipline package, refer to the suggested items and gear lists we’ve constructed just for you. AVA Rafting & Zipline wants to make sure you know exactly what is included on your trip so you don’t have to worry about a thing the day you arrive. For the Browns Canyon rafting stretch, we provide splash jackets and wetsuits for no extra cost. Take in the splendor of the Arkansas River Valley zipping across 6 lines! Trip runs 7 days a week, 8:00AM, 9:00AM. "We will definitely be coming back"
My family and I had an amazing time white water rafting with AVA. We had a safe and enjoyable experience thanks to Alex G. who showed us all cool new things about Colorado (the landmarks). She was very fun and we shared many laughs with her, and she allowed our family to create some amazing new memories! We will definitely be coming back to white water raft with you guys again sometime in the near future. Overall this was a great experience and we owe that partially to Alex G. because she was an outstanding guide.